How to connect the Coast 22 with my computer? Why can’t i finish the calibration? What can i do if the Coast 22 can't display? Why does the Coast 22 show different with my computer? How to download and install the latest driver for Parblo Coast 22? How to remove the driver? What can i do if the pen doesn't respond? What can I do if there is no pen sensitivity pressure in my frequently-used paint software? How to replace the pen tips? Try to enter Tablet setting from Start. If you can't find Tablet setting from Start, please reinstall the driver. Note to ensure there is no other tablet driver in your computer. If you failed to enter Tablet setting and get a message "Not Find Tablet". Confirm USB ports of your computer are workable, plug the USB cable into different USB ports or use another USB cable. Try to enter Quick Setup from the tablet icon of Task bar. 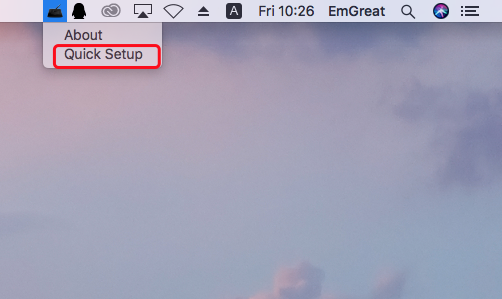 If you can't find the tablet icon, please try to plug the USB cable into different USB ports of your Mac, you'd better plug it directly into your Mac instead of via a docking station. You can also try to use another USB cable. If you get a message "No device" after entering Quick Setup, please reinstall the driver. Note to ensure there is no other tablet driver in your Mac. What can i do if my pen doesn't respond? What can I do if the pen doesn’t work?